The uniqueness of Andaz begins the moment you arrive. An Andaz host will greet you and offer the option to check in on the way to your guest room, or enjoy a complimentary beverage and check in at the Andaz lounge. Our lounge is an open, communal space that replaces the traditional lobby and is perfect for drinks in the evening or a quick coffee in the morning. 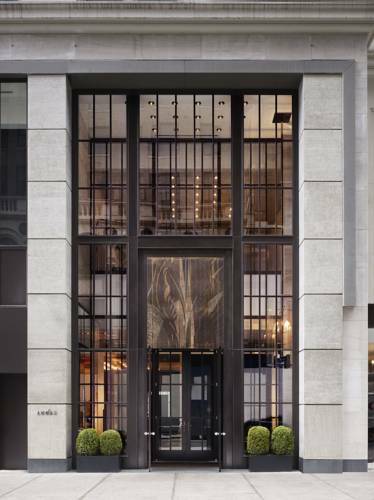 Offering hotel guests superior services and a broad range of amenities, Andaz 5th Avenue Hotel is committed to ensuring that your stay is as comfortable as possible. For the comfort and convenience of guest, the hotel offers WIFI in public areas, valet parking, bar, restaurant. Luxury upscale hotel in the fashionable Bryant Park area across from the iconic New York Public Library. Distinctive, yet historic design elements and vibrant setting. Credit card guarantee (hold) due at time of booking. Must cancel by 4pm hotel time 48 hours prior to arrival.